Easy ways to keep your child’s bedroom tidy – includes competition! 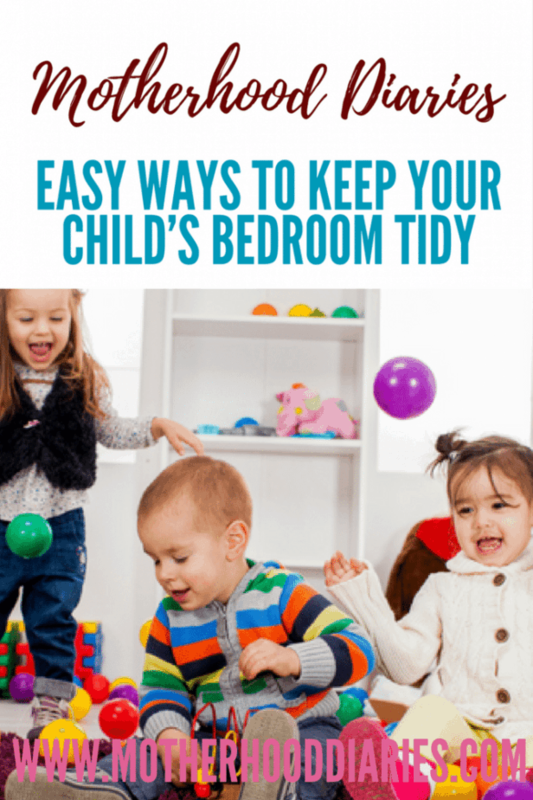 We all know the constant struggle of keeping our children’s rooms clean, as it’s probably the one household chore that takes up the most of your time. However, did you know that there are plenty of ways to make this process a lot easier for yourself? One way is to enter a great competition that I have for you below. Stickeryou.com are giving away a $50 voucher to one lucky winner so that you can get started labelling the items in your child’s bedroom. You can find labels for kids of all ages, but I would recommend using the $50 voucher on labels that will help you to organise your kids’ messy room. Check out the article below on how to keep your child’s bedroom tidy and utilise those lovely labels to keep the place more organised. But, when I see my kids tidying, I realise that they’re not entirely sure how to tidy. I find them picking up all sorts of bits and bobs and then stashing them into the corner of the room. So, show them how it’s done. Go through the process of cleaning their room with them and, most importantly, talk about what you are doing. A little independent helper in the house is always a good thing anyway. Make it clear that everything has its own place and that’s where it should go when they’re finished using it. For example, the kids store lots of board games in their bedroom. So, their new place is in one of the storage areas in their big storage shelf that houses their books. And, that’s where the board games live from now on! 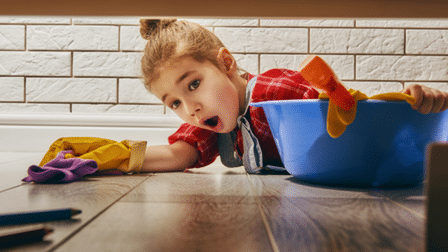 When it comes to cleaning you don’t want to have to keep going back to tidy the same spot every hour of the day – it will frustrate you and your child. Instead, adopt morning and evening cleaning routines. 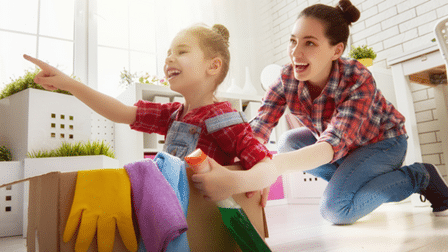 Make the bed and put dirty washing in the basket in the morning, as well as tidy away toys at night to establish a tradition that your child will look forward to assisting. Kids like routine, but make sure they understand that they can’t rely just on you to tidy things away. They need to be on top of organising their own items so that they can carry this skill with them when they are older and flee the nest. For those of us that are very in touch with that little bit of OCD inside of us, putting labels on everything is a sure-fire way to make sure that all things are kept neat and organised. You can make it fun by using illustrations in-keeping with the style of your child’s room. Combining illustrative labels with word labels can really help to influence your child’s learning as well, which is always a good thing! You can find a range of kids name labels at stickeryou.com, and you can enlist the kids in labelling their own items before they put their things away in the right place. There are tons of great labels for kids to choose from like home labels to organise storage boxes, which house different items. We have created storage space for the kids’ main toy categories, for example, Lego, vehicles, characters and other memorabilia. At stickeryou.com you can even customise your own label so that it fits with the style of your kids’ bedroom. It is well worth a shot and the kids will love organising their items with fancy labels. Don’t forget the competition below so that you can be in with a chance to win a $50 voucher to put towards your kids’ organised new bedroom! If you’re not sure which label to pick you can always order free samples from the website to try out first. Optimising your child’s bedroom with hidden storage space is a sneaky way to keep the mess away from your field of vision – it also helps to keep your child’s bedroom tidy within these storage spaces. Whether it be storage boxes underneath their bed or a bed with storage built into it like the thuka cabin beds, just make sure that whatever you are hiding away is easily accessible to them. The last thing you want is your child throwing everything all over their room trying to find what they are looking for. Literally, get on your knees and try to view your child’s room from their perspective – height wise at least! Doing this may completely change your opinion of how best to organise the room. Often, we use furniture that is more suited to adults when it comes to children’s bedrooms but this shouldn’t be the case. Smaller hands find it difficult to manage furniture like dresser drawers that they are liable to trap their fingers in – and will, therefore, be afraid to use. Introduce child-friendly furniture and you will notice a massive difference in the way they keep their room. Now is your chance to enter and win a $50 voucher to spend at stickeryou.com. It’s very simple to enter, just fill out the details below (the more points you get, the more chance you have of being a winner) and the winner will be notified by email or social media when the competition has ended. Competition is open to everyone of all ages and ends on Friday 19th April 2019, so let the games – or the labelling – begin!